Among all the cultural phenomena we are assisting to, computer culture brought to our consciences another provocation. Fundamentally new. With an evolution difficult to imagine a few decades before. Trespassing the tyranic stereotypes and the rules, computer culture strongly imposed a new set of perceptions, of spiritual exercises, a new state of mind, and, finally, new sensorial capacities. Regarding art, we can (rapidly) assert that we are in front of a true generative phenomenology, as well as a genuine phenomenology of perception. Because renewal of forms brought in the same time a slightly well-conturated «psycho-physiological » process, in full development. In which not only do we change our habbits, our criteria, but also our capacities. We see a lot more, and we see brighter, more explosive and more diverse! We hear infinitely more differentiated, more spectral, deeper, micro-structuratedly, analytically and corrosively. Oftenly with a halucinative explosive force. We endure once intolerable audio-video « radiations », enlarging the proportions of our own genetic limits. Concluding, we are confronted to a new decisive, prevalent evidence! Which you cannot, by all means, elude, unless becoming in the end an outcast! Could Romanians stand behind this process, with their well-known traditionalist inertias, but with their sensitive elite, as well, defined through the years as essentially avant-gardist, restructurative and remodelling? Could they remain indifferent? Isolated? Autarchic? By no means! vigilence and an anarchy against all the « modernisms » were melted, sequestrating life, truth and becoming! 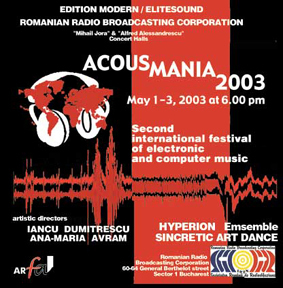 - here we are, at last, able to conturate for the first time, in an adequate frame and at the necessary anvergure, an authentic International Festival of Computer and Electronic Music in Bucharest. Radio Romania not only becomes the receptacle, the siege of election for these artistic adventures, but as well the core, the decissive, dynamic part of this phenomenon, trying to recuperate time, abscences, to adapt casually to a continuously changing world, with miraculous becomings, in a way devoted at the most to the new directions. And it does it for the first time, understanding profoundly, phylosophical-culturally speaking, the motive, the reason for which it has this natural option; the long-term bet of its renewed approach! In the artistic hours to come, will we be able, by chance, to « retouch » or « rewrite » hystory, to give back to music its natural rhythm, and, first of all, will we be able to provide the public - those for whom this festival is intended - the trust and spiritual disponibility, in order to be, for once, satisfied with his aims and his recoveries? In the short and eventful period in which we have designed this event, have we really managed to overcome the knowledge and the « traditions » of the festivals from abroad? This is the last question, and I must reckon the answer is a very difficult one.